Skydiving is the ultimate Adrenalin rush! Experience the unparalleled thrill of free-falling for up to 60 seconds at awesome speeds of approximately 200kph during a tandem skydive. Tandem Skydiving is one of life's ultimate thrills. Your experience begins with a simple ground briefing and an overview of landing procedures. You then board the plane and begin your flight to altitude. As you reach jump height, a final systems check is carried out. Take a deep breath - it's time to exit the plane! Nothing can prepare you for the sensation of stepping into thousands of feet of emptiness. You will be travelling at over 200kph in free-fall, with the air rushing into your face and your adrenalin pumping. As the parachute is deployed, the silence and view are amazing during the amazing descent under canopy right over the Great Barrier Reef, tropical islands and world heritage listed rainforests right onto Mission Beach, south of Cairns. On completion of your skydive, your adrenaline is sure to be pumping! Bathe in the glory and great sense of personal achievement. 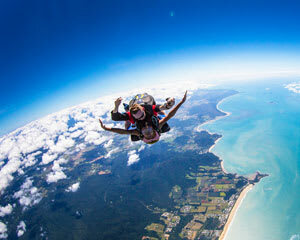 If you are thinking about jumping once, or just having a taste of skydiving, a tandem skydive is the way to go! Weight surcharge applies to those over 95kg (payable on the day see below for full details). 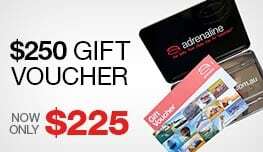 Very impressed with Adrenaline and the skydive team in Mission Beach and Cairns.